The Diana o Versailles, a 2nt-century Roman version in the Greek tradeetion o iconografie (Louvre Museum, Paris). 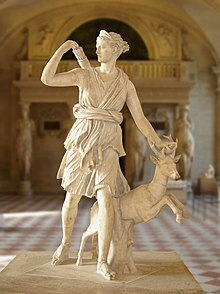 In Roman meethology, Diana ([djana]) wis the goddess o the hunt, the muin an bairnbirth, bein associatit wi wild ainimals an widland, an havin the pouer tae talk tae an control ainimals. She wis eventually equatit wi the Greek goddess Artemis, thou she haed an independent origin in Italy. This page wis last eeditit on 18 Apryle 2016, at 20:49.